No matter your level of sponsorship, it goes without saying that your stickers need to be crystal clear. 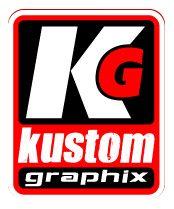 Perth signwriters like Kustom Graphix are into the race car graphics business, carefully crafting each piece to customer specifications. Aside from V8 Supercars, they also handle other race cars like Formula 500, Sprint Cars and Speed Cars.